All engineering majors at the masters level may spend a semester at Georgia Tech-Lorraine. Students must take at least 9 semester hours of courses. Current students in their last semester of study may receive permission to take as few as 6 hours of coursework. Opportunities for PhD students to spend just one semester at Georgia Tech-Lorraine are limited. Students must be self-funded. Joint BS/MS students may complete the masters portion of their program at Georgia Tech-Lorraine. Students have the option of doing a thesis or non-thesis masters. The majority of masters students at Georgia Tech-Lorraine choose the non-thesis option. For those students interested in doing the thesis option, we recommend reviewing the various research groups on campus and reaching out to professors directly. There is also the possibility of finding an advisor on the Atlanta campus, and completing one's thesis in Atlanta after spending two semesters on the Lorraine campus. This innovative program provides students with the opportunity to earn two prestigious degrees - one from Georgia Tech, and one from one of our partner institutions. Students interested in this program do not need to speak French; many of our partner schools offer their programs in English. US and other international students typically will spend their Fall and Spring semesters at GTL completing their MS requirements for Georgia Tech before moving on to the partner institution. Dual-degree students will have the option of completing a masters thesis at the partner institution, or doing an internship. Students already studying at one of our partner institutions should contact their office of International Relations for more information. Contact Dr. Bertrand Boussert for information on academics at Georgia Tech-Lorraine. This program capitalizes on Georgia Tech’s academic presence in Atlanta, Georgia USA, Metz, France, and Shenzhen, China. 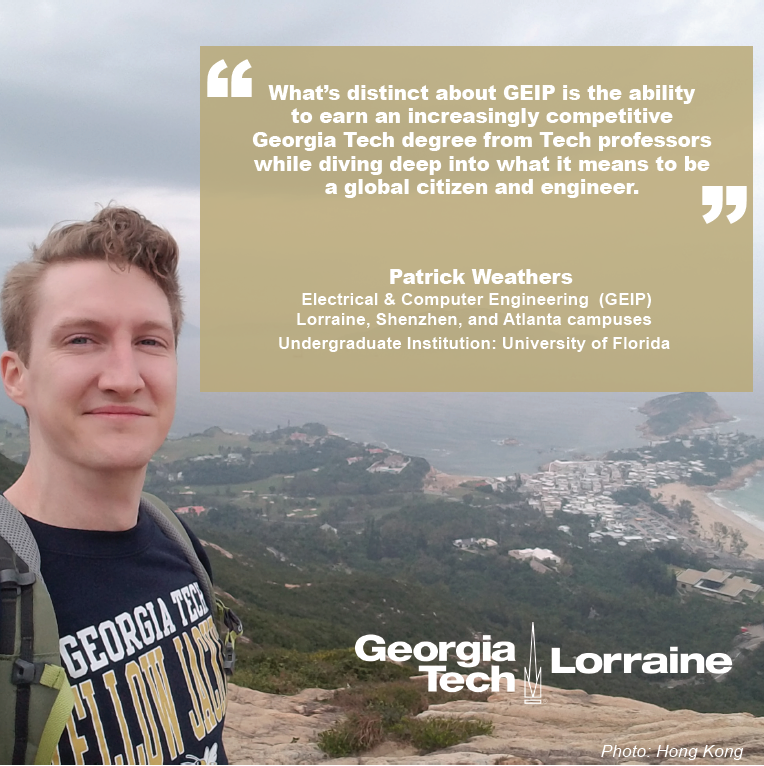 Students complete their masters degree in Electrical & Computer Engineering by studying with Georgia Tech on 3 different continents – North America, Europe, and Asia, earning a master's degree in as little as 12 months. Contact the GT-Shenzhen office for more information on the Shenzhen, China portion of the program. Click here to see current research positions at Georgia Tech-Lorraine. Visit the GT-CNRS UMI website for more information.